De RED 2018 boardbag is alweer een stuk verbeterd tov de 2017-uitvoering. Met een nieuw geïntegreerd back pack system! 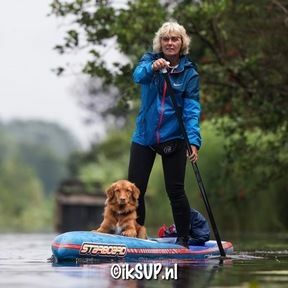 Met deze tas van RED neem je je supboard overal mee naar toe! Dit is een stevige tas met wieltjes die je gemakkelijk mee kunt nemen in het vliegtuig. Maar hij past ook met groot gemak in de auto of in een bakskist op je boot. Bovendien kun je je board op je rug dragen dankzij de uitneembare brede en comfortabele draagbanden. In de tas zijn bevestigingsstrips voor je 3-delige paddle en een vak voor je vin, zodat je alles in 1 tas bij elkaar mee kunt nemen! We bang on about this a bit, but there’s no better way to explore your world than with an inflatable SUP – bag it up, throw it on your back and you’re free to find adventure. At Red Paddle Co, we pride ourselves on creating an authentic paddling experience, which means all of our kit has to perform to an exceptional standard – whether that’s on the water, or when you’re travelling and transporting your board, paddle and pump with you. No bag existed that met our demands – so we created our own. Our solution is the world’s best inflatable SUP bag, an innovative backpack designed to make taking your board to the farthest corners of the Earth as easy as possible. It’s made using toughened materials that can cope with sun, sea, sand and damage. It even has a foil lining to ensure your board stays cool in extreme temperatures. When you’re not out exploring, it serves as the perfect storage unit, too. Other unique features include: Address label window just in case your board goes walks, a useful way to ensure you’re reunited; double stitched seams super strong bonded nylon sail-making thread and double stitched seams; Strap stash when you don’t need to carry the bag on your back, you can store your straps away through an easy to use velcro system; Backpack system the pack has an ingenious carry system, with padded shoulder and waist straps; Integrated wheels A top handle and a set of wheels, so you can simply cruise along; Paddle Storage fitted with a neat system to keep your 3 piece paddle in place when transporting your kit; Internal loading strap stops your board from moving around when being carried and finally an Internal pocket where you can keep any small items stored.